Shell E&P Ireland has urged the Department of Energy to ensure “prompt processing” of its application to operate the Corrib gas pipeline, as it says that “all of the elements of the Corrib gas field are in an advanced state of readiness”. Shell Ireland has officially applied to the Government for permission to operate the controversial pipeline from the Corrib gas field off the coast of Mayo. The application is the first to be made under the Gas Act since the completion of its construction. The pipeline is a joint venture by the Corrib Gas Partners which comprises Shell E&P Ireland Limited, Statoil, and Vermillion. 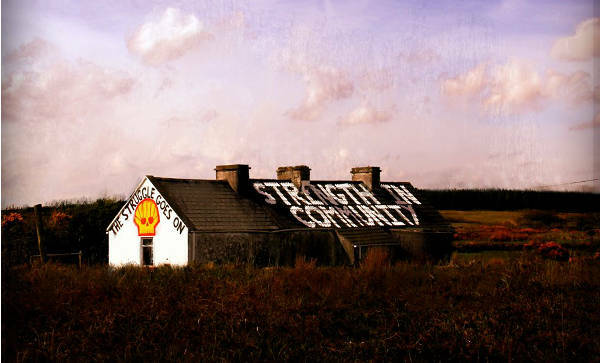 Songs for Rossport (working title) is a project that collects poetry, song and verse written over the last 15 years about the community struggle in northwest Mayo for a safe and clean environment. This collection features the work of John Spillane, Fintan Vallely, Jinx Lennon, Ronán Ó Snoddaigh, John Hoban, Brendan Begley, Louis de Paor, Rita Ann Higgins and Margaretta D'arcy to name but a few of the contributors. We have gathered together a great number of old songs and new recordings and we wish to make this collection publicly available on CD and digital download. We are also building an online platform to host the collection as an accessible archive. The collection will be officially launched in Galway city this autumn with a gala concert. To do all of this we need your help as there is a considerable cost involved, particularly for CD production and printing. Your investment in this project will ensure that you and many more people get to hear these fabulous songs. I refer to my letter to you dated 29th July 2015 (see attached) and would like to draw your attention to further dumping of foreign materials in Broadhaven Bay (SAC) by operatives of Shell E & P Ireland. The Health and Safety Authority has referred the findings of its investigation into the death of a German national in the Corrib gas tunnel almost two years ago to the Director of Public Prosecutions (DPP).